The governor expressed a reluctance to use interest rates as a way of cooling down the housing market because it would affect all parts of an economy only just recovering from recession. 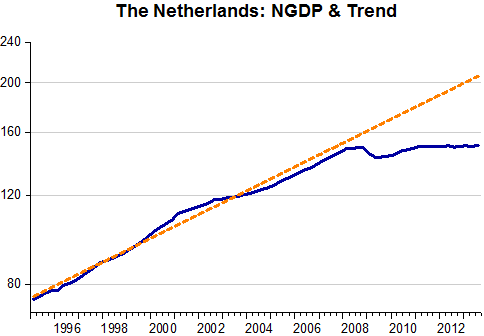 The reality is that even The Netherlands has been destabilised by monetary union despite being a creditor state and despite close trade ties to Germany. The country is now stuck. S&P expects the Dutch current account surplus to rise to 10pc of GDP from 2013-2016. And no, this is not a sign of health. Extreme imbalances are always bad. A deformed structure has become entrenched. 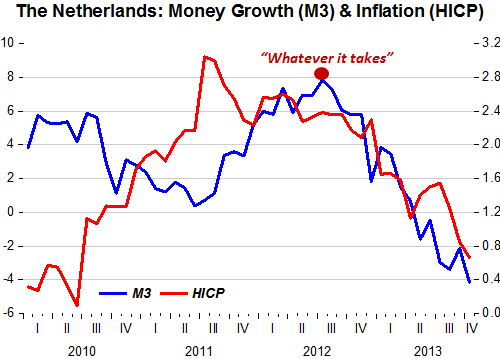 What surprises me is that the Dutch central bank has gone along with the ECB’s over-tight policy so lamely. Why did Governor Klaas Knot vote with the hawks against the ECB’s rate cut earlier this month? Is it some sort of Calvinist solidarity, “zachte heelmeesters maken stinkende wonden” as the old Dutch saying goes? Why is he lining up with the hardliners when the ECB is missing its own M3 and inflation targets by a country mile, and when this policy mistake is doing so much damage to both Europe and his country? I´m coming to this on the footsteps of Lars, Britmouse and Ambrose Evans-Pritchard. But I couldn´t resist putting up a couple of “swap images”! Monetary policy is ‘brightening’ Japan and ‘dooming’ the Zone! 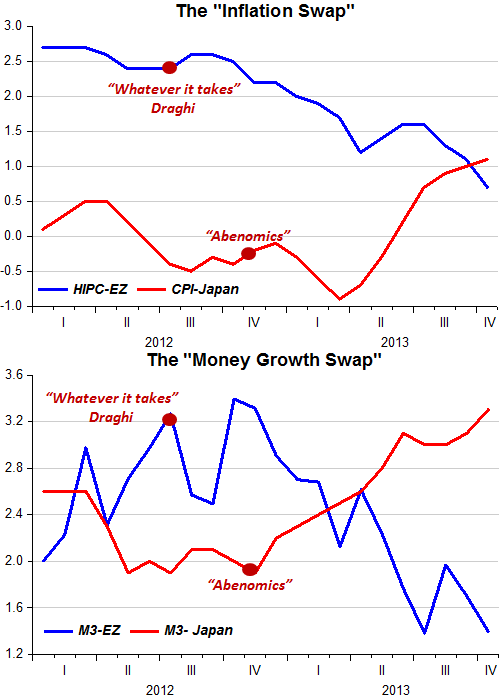 It appears “Abenomics” packed much more punch than Draghis´ “whatever it takes”. One is a PM the other just a CB Head (in a dysfunctional Union)! ‘Bubbles’ are really getting out of hand! I had no idea that Sweden has gone all-in on raising interest rates to fight “financial instability.” (Alas poor Lars Svensson!) Simon Wren-Lewis has details, Krugman has more, and Peter Orszag had a great columnabout how New Zealand is instead using regulations to fight worries about the financial system. I’ve been long fascinated by this topic. The stakes are very high: should we endure a mini-recession, with lower employment and output, to fight a thing called “financial instability”? It shouldn’t be clear to a random person which of these [transmission channels] would dominate over the other, thus making me believe that raising interest rates would likely be a wash in terms of financial stability. But it would definitely move us further away from full employment and price stability. Now if I had to put money on it, I know that the risk channels can be tackled through financial regulation, while I believe the idea that running a larger output gap, with weaker incomes and more unemployment than necessary, will somehow fix consumer balance-sheets is borderline insane. So why are so many countries going this way? Does capital just have an inherent right to a certain level of return regardless of mass suffering? Wish we had more Australias and less Swedens. We should not dismiss the possibility, raised by Larry Summers that we may need negative real rates for a long time. Countries could in principle achieve negative real rates through low nominal rates and moderate inflation. Instead, we are still facing today the danger of an adverse feedback loop, in which depressed demand leads to lower inflation, lower inflation leads to higher real rates, and higher real rates lead in turn to even more depressed demand. In 1981, given entrenched inflation expectations, to obtain a significant reduction in inflation the Fed ended up provoking an also significant increase in unemployment. By 1984 the ‘back of inflation expectations had been broken’, so the Fed was successful in engineering a rise in spending which was accompanied by a drop in both inflation and unemployment. 2009 is the ‘half opposite’ of 1984. With inflation expectations ‘stable’, the steep fall in spending by the Fed results in a big increase in unemployment. So what we have now is a situation where the Fed (and other central banks) has fallen into an “expectations trap”. That´s the expectation by the public that inflation will remain on ‘target’ (little risk of inflation being either ‘too low’ or ‘too high’). Since it´s not advisable (for both political and economic reasons) to try to ‘pull-out’ of this ‘trap’ by ‘inducing’ people to increase their expectations of inflation, the best option is to change the ‘target’. And the most promising alternative is an NGDP level target. Australia is a case in point. As I argued here, Australia did not let NGDP tank like many other developed countries. The result is that it shook-off both the Asia crisis of 1997/98 and the international ‘financial’ crisis of 2008/09. I like Blanchard´s title. It indicates we have to undergo a ‘regime shift’! Maybe a clearly specified nominal target other than inflation? Without meaning to, he defends an NGDP Level Target! The Federal Reserve Bank of San Francisco published a letter titled, Consumer Inflation Views in Three Countries, written by Bharat Trehan and Maura Lynch. The letter explores inflation expectations among consumers in the UK, US and Japan. Basically the story is that inflation expectations by consumers are tied to the level of oil prices and recent inflation. Policy adjustments by a central bank do not play much of a role in determining their inflation expectations. The inflation expectations of consumers are important to evaluate the spending and wage demands of consumers. If consumers raise their inflation expectations, they would bargain for higher wages, only if they have power to do so. Labor has little power nowadays to bargain for better wages. So what the letter from the FRBSF is missing is a comparison between what consumers expect of inflation and what they expect from their own incomes. Simply put, if I expect inflation to be 3%, but expect my own income to rise at around 0%, then I feel I am losing ground… and I will be less likely to spend money. Surely it makes more sense to spend money now since prices are rising faster than I can keep up with them, right? No… Spending more money now would make me feel even more insecure. Solution: Give them reason to expect higher incomes going forward. Adopt an NGDP level target! If the Fed was to raise their interest rate, the return on savings for consumers would go up, and consumers would feel a bit more empowered to spend. Of course, the government would have to pay more to service its debt, but consumers would feel secure to spend more. Thus, we see a form of financial repression at work which has the effect of suppressing consumer spending to the advantage of the government and owners of capital. This is a version of Kocherlakota´s 2010 argument that if rates remained low, deflation would set in! Some think that for getting that sort of advice Kocherlakota fired some of his advisors! It´s ‘unfortunate’ because there are really no benefits to be reaped from price level targeting (PLT)! 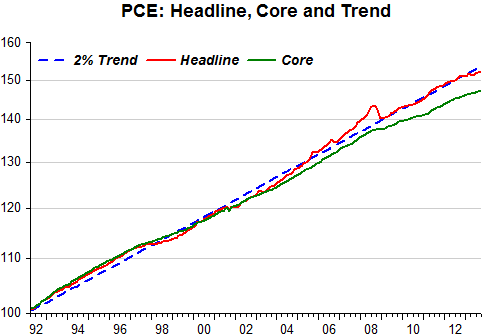 The picture below shows the 2% trend and both the headline and core PCE since the early 1990s. While the headline PCE has come back to trend after the ‘separation’ induced by the oil shock of 2007-08, the Core measure, which was just about to ‘hug’ the trend level was pushed down when the crisis hit. Bernanke and the Fed may feel comfortable that they are hitting at least the stable price part of their mandate. But the other part, maximum employment, is only a dream. 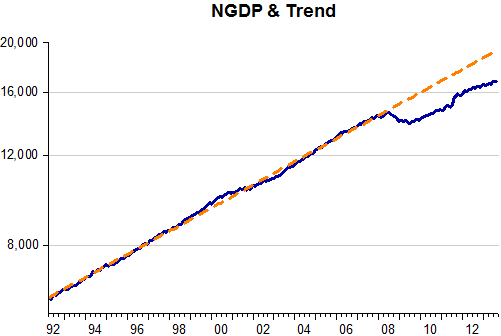 And the reason is that, as shown in the next chart, nominal spending (NGDP) is far below trend. Note that before the crisis both PLT and NGDPT were ‘observationally equivalent’. I venture to say that that´s because NGDP was kept close to the trend level. Once monetary policy failed in keeping demand (spending) growing at the requisite rate, nay, allowing it to crash, the idea of stable prices is hard to defend given that, excluding volatile elements, prices have remained also far below trend. In fact, it´s quite likely that the spending crash came about because the Fed was paying too much attention to oil price developments, and felt it was necessary to constrain demand to bring headline PCE down. PLT may be better than IT, but it fails miserably when there´s a supply shock (such as the oil price rise) to the system. And it fails because it fosters the wrong action by the central bank, pushing it to constrain demand i.e., forsake nominal stability (which contemplates both prices and output, P*Y). PS To my american readers, an enjoyable Thanksgiving. Lorenzo has written a very good introduction to NGDP Targeting: “Money, prices, assets and evasions of responsibility.” In his e-mail he writes: “I have a go at justifying NGDP targeting to a lay audience”, and does a good job at it. Coincidentally, in the last couple of days I argued that while most central banks were acting alike, the RBA was an exception. The difference between the RBA and the BoJ, the Fed or ECB is that while all four central banks have inflation targets, the RBA also has an implicit income target. That is, the expectations are that the RBA will keep Py relatively stable (i.e. tolerate a higher rise in P if y is flat and vice versa) since its inflation target is an average over the business cycle. 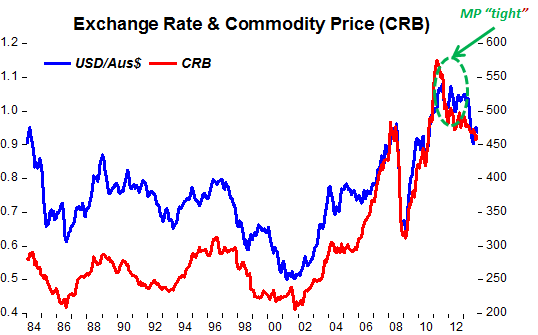 Another way to look at that is to say the RBA is effectively operating an export price norm. (Which leads us back to Lars Svensson’s “fool proof” way out of a liquidity trap.) If income expectations do not collapse, there is not a flight to safe assets (such as money in a low inflation environment) and so spending does not collapse. The huge failure of inflation targeting is the failure to realise the importance of managing income expectations when strong central banks credibility on inflation means money can be a safe asset. (And if you suspect that is something like the failure of the gold standard central banks to realise the importance of managing income expectations when fixed gold convertibility means money can be a safe asset, you would be correct.) Both inflation targeting and the gold standard permitted central banks to evade responsibility for aggregate demand while they were, nevertheless, driving aggregate demand. 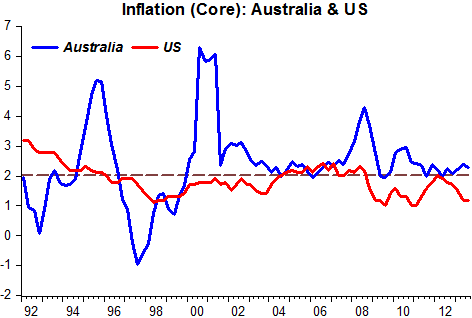 No wonder Australia is the only developed inflation targeting country not to have experienced a recession since the target was adopted. IT was introduced in Australia in 1993, with the last recession taking place in 1991. Yesterday I illustrated with the Riksbank and the Fed that most central banks were acting alike. But as usual, there are exceptions to the rule! Australia’s central bank appears to be stepping back from hints that it might intervene to bring down the level of the local dollar — but the option can’t be ruled out entirely. To be sure, some of the shine already has come off the currency, which is down about 12% against the U.S. dollar so far this year. But it has made back significant ground since its late-August nadir and remains strong in historical terms, aided by a positive interest-rate differential with the United States and Australia’s relatively strong economic fundamentals and AAA credit rating. Aside from rhetoric, the RBA appears to have few arrows left in its quiver. The bank has cut rates eight times since late 2011 to counteract a decline in Chinese demand for Australian minerals and ores, which has helped to revive local spending. But cutting further could be difficult. The RBA has held rates steady its last few meetings, mindful of further pushing up house prices, which already are growing strongly. That has left the central bank with few options other than talking the currency down. The unusual hints of intervention — the RBA hasn’t intervened since October 2008, just after the Lehman Brothers collapse — may indicate exasperation that previous jawboning has had only limited impact. Expect the jawboning to become shrill if the Aussie dollar rallies again. And if all else fails, intervention itself can’t be ruled out. 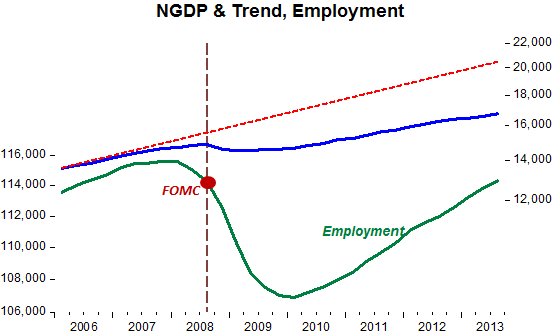 The charts below picture NGDP and the trend, the policy rate and inflation. 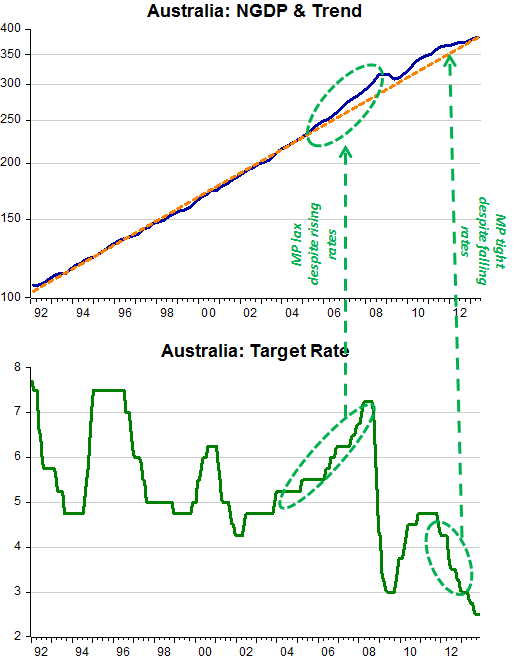 Just before the crisis hit, monetary policy in Australia was “easy”, despite the rise in the policy rate. I say that because NGDP was rising above trend (growing above the trend rate). 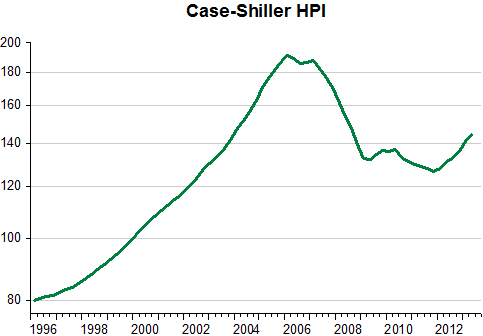 Inflation also rose. By tightening monetary policy during 2012 (again, despite falling rates), the RBA managed to bring NGDP back to trend. It will be successful if it keeps it there. Compared to other central banks, who have managed to let NGDP fall (and remain) far below trend, that´s no mean feat. And note that inflation has not taken off, remaining very close to the target, also something the Fed or the Riksbank have not accomplished! Note that Australia is far away from any “ZLB”. Also, there´s a lot of talk of “Secular Stagnation”, reflected in decades long fall in bond yields. 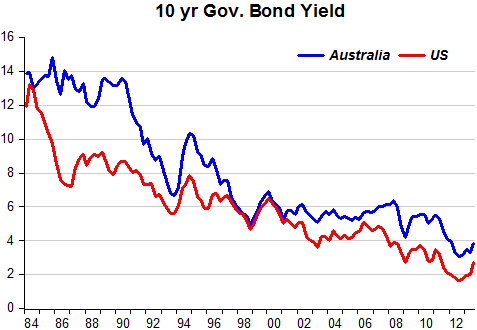 The chart shows long term government bond yields for Australia and the US, but no one´s heard of “secular stagnation” in Australia! As a result the increasingly lax standards for FHA insurance once again made foreclosures commonplace. From 1975 to 2011, over 3 million FHA borrowers would lose their homes to foreclosure. Over time, powerful lobbies, politicians, and HUD pushed to replicate FHA’s abandonment of commonsense underwriting at Fannie Mae, Freddie Mac, and other parts of the mortgage market. For 8 million families experiencing foreclosure from 2007 to the present, “mortgage” once again became just another word for trouble.